Lucy Yi was born in 1815 in China. Lucy was the youngest child in her family and very dedicated to pray every day. When she was 12 years old, she decided she would consecrate her life to God. She loved reading and learning. When she was 20 years old and pursuing her college education she fell ill. After her recovery Lucy took her spiritual life still more seriously. She knew she could not leave her family to become a nun because they needed her financial help. So she prayed daily and worked to support them. After her father died, she lived with her brother and mother, using part of her time to teach the faith to children nearby. The parish priest, who asked her to teach at the school, noticed her devotion and knowledge of her faith. After four years, her brother went to school to practice medicine, and Lucy and her mother moved with him. In Chongqing, the priest also asked her to help teach the women in the parish. When she was offered money for her work, she refused to take it and offered her work to God. She wanted to do missionary work and join a convent, but her poor health forced her to move back to home. She taught when she was able and went on mission trips. In 1862, while on a mission trip in another province, the missionary group entered a region with encountered hatred and hostility towards Christians. The local governor there also hated Christians and he imprisoned and sentenced to death the priest and several missionaries with the group. She was also jailed and put on trial that very day and sentenced to death, because she refused to renounce her faith. The following day she was executed. 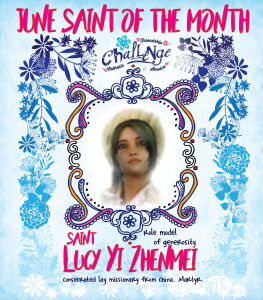 Pope John Paul II canonized St. Lucy Yi and her companions, the Martyr Saints of China on October 1, 2000.